Elon Musk famously tried to take Tesla private at $420 a share. Goldman Sachs thinks the pioneering electric car company is worth half that. The Wall Street investment bank broke its silence on the Tesla fiasco on Tuesday by reinstating a "sell" rating on the stock and issuing a $210 price target. The bank's biggest concerns: Tesla's (TSLA) debt-riddled balance sheet and "intensifying" competition that may erode its lead in the electric vehicle race. Musk tweeted on August 7 that he had "funding secured" for a deal valued at $420 a share — a claim that reportedly sparked an SEC investigation. Facing what Musk described as a shareholder revolt, the billionaire CEO abandoned the go-private plan on August 25. Musk's tweet initially sent Tesla shares spiking to as high as $389.61 on August 7. Since then, Tesla shares have lost a quarter of their value. Goldman Sachs predicts they'll tumble another 30% over the next six months. 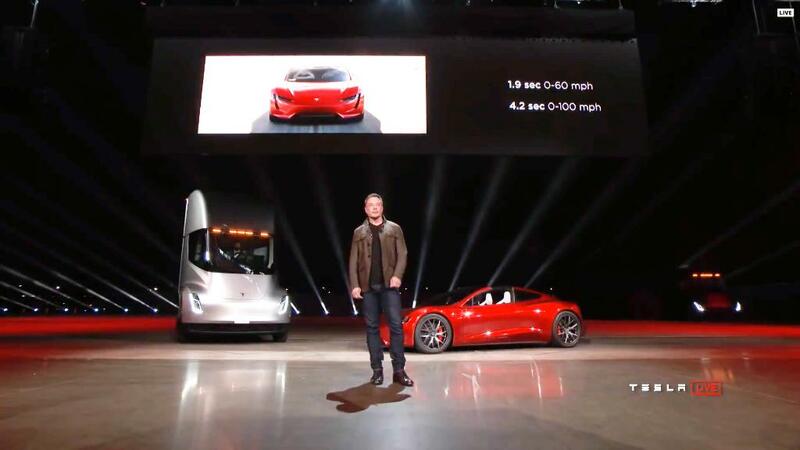 "We remain bearish" on Tesla's ability to execute, ramp up vehicle production and generate free cash flow, Goldman Sachs analysts led by David Tamberrino wrote to clients. The firm did not weigh in on the controversy around Musk's erratic behavior. Instead, it focused on the bevy of electric cars being launched by rivals, from Ford (F) and Jaguar to Porsche and Nissan (NSANF). Although Tesla isn't expected to launch its Model Y until 2020, Goldman Sachs says the company faces a "large crescendo" of competition in the coming years. For instance, Daimler's (DMLRY) Mercedes-Benz revealed its first all-electric SUV on Tuesday. It's the first model under the German car maker's electric EQ brand. Rival luxury manufacturers BMW and Audi (AUDVF) are also getting deeper into the electric vehicle game, threatening Tesla's dominance. Here's another obstacle for Tesla: Its cars are about to get more expensive. A tax credit for buyers of electric vehicles is set to expire for Tesla at the end of the year. The full tax credit is gradually phased out after a company sells its 200,000th electric car in the United States — a milestone Tesla passed in July. "We believe the higher price point buyers for the Model 3 could be exhausted for Tesla by year-end," Goldman Sachs wrote. It's not just Goldman Sachs expressing concern about Tesla following a turbulent summer. Last week, Cowen & Co. warned that Tesla faces "mounting obstacles," including shareholder lawsuits and scrutiny from regulators. "The tweeting fiasco," Cowen analyst Jeffrey Osborne wrote to clients, "is likely to draw investor scrutiny on whether Elon's behavior, management style, and operational ability are enough to take Tesla to the next level." Of course, Musk has repeatedly proved his critics wrong. He's built Tesla into a revolutionary company worth more than Ford or General Motors (GM). And the good news is that Tesla has been ramping up Model 3 production, helping to improve its precarious financial position. That should allow Tesla to (briefly) stop burning cash. Goldman Sachs expects Tesla to generate positive free cash flow during the second half of 2018. However, doubts remain that Tesla can scale up or even maintain that production rate. It's a major issue because Tesla is sitting on a ton of debt — and the bills are due soon. Net debt (debt minus cash) has nearly doubled to $9.2 billion over the past year. Goldman Sachs says Tesla's balance sheet is "concerning" for an auto company. The firm noted that about $7.5 billion of Tesla's debt is coming due by 2022. Musk insists that Tesla won't need to raise more cash by selling shares or raising debt. Wall Street is skeptical. Goldman Sachs thinks Tesla will need to raise capital during the first half of 2019. Cowen says Tesla will raise $2 billion this quarter, but warned it "may prove a challenge" if the company is under investigation.